Our new office built in 2012 offers up to date technology and comfort, right down to massaging exam chairs and ceiling mounted televisions! 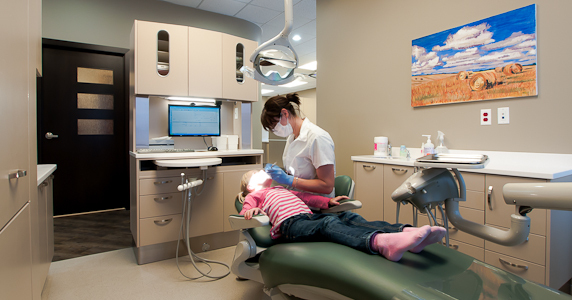 Willowgreen Family Dental strives to provide patients of all ages with personal and comprehensive dental treatment in a relaxed and friendly atmosphere. We offer nitrous oxide (laughing gas) which is often good for treating young kids, or anxious patients of any age, digital radiography offering decreased radiation dosage as compared to conventional xrays, in ceiling TV's and Special “kid’s room” for treatment of children.